The sun sets so fast when your are so close to the equator. Within a quarter of an hour, the sky changes from a bright blue to a flaming orange and finally a dark violet in a dramatic play of colours – until the sun sinks into the sea. The outdoor terrace of beach club and restaurant Moon, about 15 minutes walk from the city of Willemstad, is the best location to enjoy this spectacle of nature. The waiter serves an ice-cold “Awa di Lamunchi” – lime syrup on crushed ice – and lights the lanterns on the terrace. Waves are crashing gently on the rocks underneath the terrace. “Fish or meat”, he asks. Given the diversity of Creole cuisine you can be glad that the experienced chef takes one or the other decision on your behalf. “Fish please”, after all we are in the middle of the Caribbean. 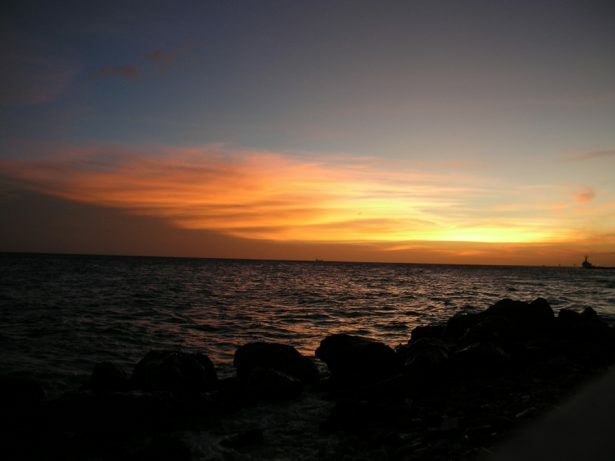 Even though the Venezuelan coast is only 70 kilometres away from us and clad in darkness, on Curaçao you feel isolated – from everyday life and from the rest of the world. The island state might be a bit sleepy, but anything but behind the times. 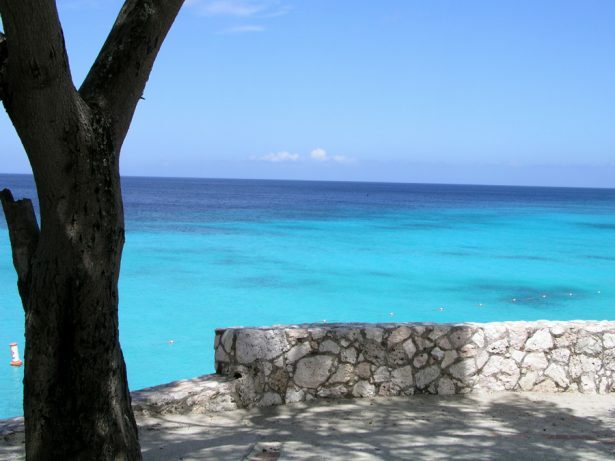 While most of the other islands of the Caribbean are not necessarily gay-friendly, the inhabitants of the 444 sqkm of Curaçao have long understood that gay tourists are generally very pleasant people. One of the reasons why Curaçao is hosting a kind of Pride for the sixth time this year. “Get Wet“, the annual Pride weekend in September, is a small but fine affair. 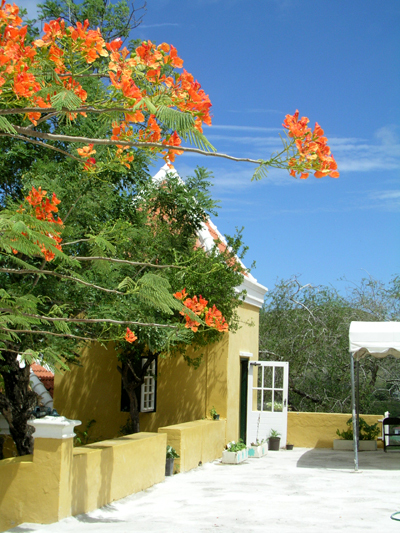 A meet-and-greet reception in the museum garden of Kura Hulanda Resort, a screening of a gay film on Willemstad beach and a beach party on one of the white beaches in the southeast of the country. “For an island like this, 300 participants are a lot,” says Kurt Schoop, one of the organisers. “We started with private parties in the backyard”, says the full-time business consultant, “recently we are officially a foundation, and last year we had sponsors on board for the first time with Amstel Brewery, charter company Arkefly and the Kura Hulanda Hotel”. The inhabitants of the tropical island are not only open-minded and talkative, but above all linguistically gifted. With Papiamentu, Dutch, English and Spanish, most children already speak four languages. The Creole language Papiamentu, like the history of the island and its inhabitants, is a mix of different cultures. At meals they use the French term Bon apétit, strawberries are called stròbèri, potatoes like in Dutch ardapel, and the heart beats Spanish as a kurason. Curaçao was discovered by Spanish sailors exactly 510 years ago. The original inhabitants of the island were Indians. Strong guys whose body size is estimated to be up to 1.80 metres based on skeleton finds. The Spanish, on average about 20 centimetres shorter, called the island “Isla de los Gigantes” and shipped almost the entire population as slaves to the new sugar cane plantations on the island of Hispaniola, home of modern Haiti and Dominican Republic in these days. 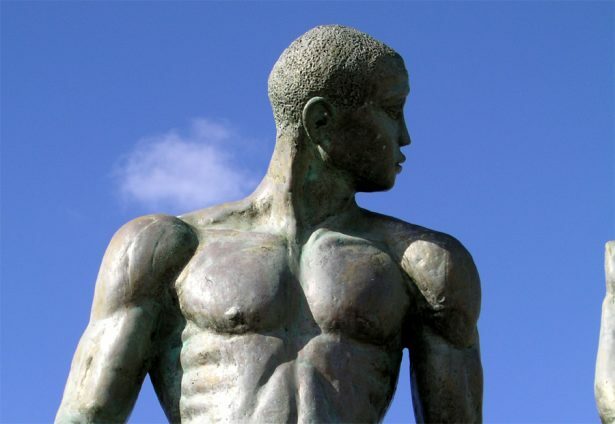 But it were the Dutch who developed the natural harbour of Willemstad into one of the largest slave markets in the world and made the island one of the richest in the Caribbean. Slavery was officially abolished in 1863, but the descendants of the abducted Africans remained and still shape society today with immigrants from other Dutch colonies. The island is still part of the Dutch kingdom, and will remain so, even though independence is a much-discussed issue on all six Dutch Caribbean islands. It is hardly imaginable for tourists that politics are so dominant on a dream island like Curaçao, where life seems so colourful. Turquoise and yellow the houses, azure blue orange liqueur produced in an old mansion. 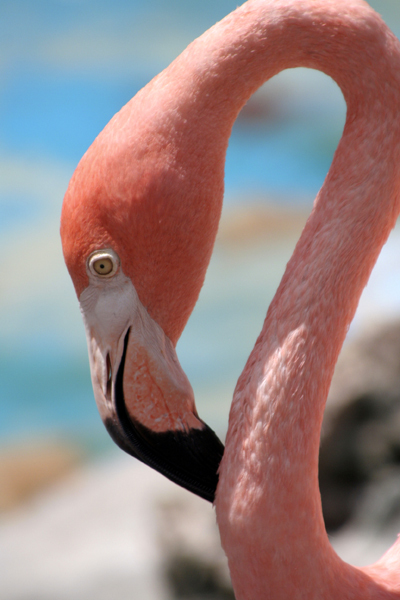 Pink flamingos that you might spot in one of the flat salt lakes in the west with little luck, at leat at the Sea Aquarium on the island. If all this does not satisfy you, you can go diving and enter into a universe of shimmering luminous sea creatures. The Tourist Board offers training courses several times a year. “We train hotel employees, taxi drivers and tourist guides to provide a good service to tourists. This also includes Gay Cruises. You have to be prepared to handle up to 1000 guests at once”, the 39-year-old tells with a wink. Targeted worldwide advertising campaigns suggest that the main target is party- and beach-loving gay Americans and Europeans. 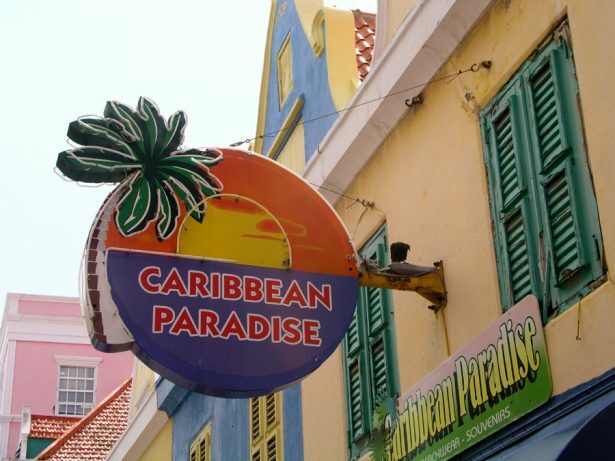 Curaçao uses the continuing negative image of other Caribbean islands such as Jamaica or the Bahamas and their homophobic tendencies to slowly but positively position itself as a gay paradise. Curaçao is on a good course there.